Generously listed at 5-foot-11, 180 pounds, Michael Sit never has been known for his thundering hits or ruggedness in the corners. Not that he shies away from contact. But a power forward? No. “I’ve never been one of the bigger guys out there,” Sit said. That will change soon enough for the Edina senior, who on Friday, Jan. 7, accepted an offer to play at Boston College. “When I was out there they told me I would be a giant on their team because they have so many short guys,” said Sit, who ranks second on the defending state Class 2A champion Hornets in scoring with 20 points (five goals, 15 assists). While the defending NCAA Division I champion Eagles have plenty of 6-foot-plus players on their roster, many of their biggest stars (Cam Atkinson, Brian Gibbons, Joe Whitney) stand well under 6-feet. Sit said his mother grew up in a Boston suburb, and he has been taking family trips to the city since he was a kid. Sit said he visited Princeton and was also interested in Holy Cross and Amherst. 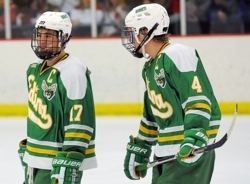 Sit is the second Edina player in the last week to commit to a Division I school. Senior defenseman Max Everson chose Harvard over the University of Minnesota on Sunday. Hornets senior forward Steven Fogarty previously committed to Notre Dame. Giles said Boston College coach Jerry York, who is entering his 39th season as a head coach, was most interested in learning about Sit’s tenacity.